From Changes' inception, R. N. Taylor and Nicholas Tesluk have woven bardic tales of gallantry, chivalry and of larger-than-life legendary and mythical heroes. They've sung of new love, love unrequited and love lost. They've written songs painting sonic imagery foretelling a dark apocalyptic future, which later came to pass while currently prophesying a society in the seminal stages of an even darker fate. With their new album, Lament, they turn their gaze inward, to their own personal apocalypses, stemming from their long marriages ending in dismal dissolution. They tell of their dark, oppressive inner-world that sought to drive them beyond the brink of despair. Only by being able to immerse themselves in their art and create works expressing these sorrows would they be able to maintain their sanity. Lament reaches out to all who've had their lives disrupted by modern societal partners going through mid-life crises, becoming antagonistic strangers to their families overnight. The song entitled "The Invisible Man" tells a tale based on H. G. Wells' novel with a personal twist. In their song "Emily", the historical figure of poetess Emily Dickinson comes to life. The "Mountains of Sorrow (Remix)", is an instrumental song enhanced by the deft arrangement, musicians and singers of Der Blutharsch with a voice-over by R. N. Taylor of his heart-rending lyric poetry. Also included, new versions of three of Changes' earlier works; "The Saddest Thing", "Sweet Eve" and "Memorabilia" as these songs merged well with the album's concept. 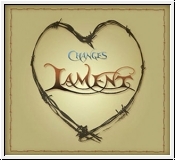 Lament is sixty-four minutes in length with thirteen tracks. Comes in nice Digipak with a sixteen page liner booklet.